Today we had a family cookout with my in-laws. They have had company the last few weeks so it was the first time that they got to come see our new house. We wanted to make dinner as well so we picked up steaks from Costco (best place in Calgary IMO) and planned to throw them on the grill. One decision down but I wasn’t sure what else to make. It’s been so hot the last week or so that I really didn’t feel like heating the house up by using the oven or the stove. Well, I guess that means SALAD time! Everyone loves feta so I decided to try my hand at Greek Salad. I decided to try two (though I made one exactly as written and the other…well, I used it as inspiration)….one for Greek Salad and one for Honey Lime Fruit Salad. Fresh and tasty, this recipe benefits from the use of farm fresh veggies! Mix first 8 ingredients in a small bowl. Place romaine in a large bowl along with other salad ingredients. Salad ingredients can be prechopped and kept in the refrigerator for an hour or two. Just wait to dress the salad until right before you serve it. For dessert I served the Honey Lime Fruit Salad with vanilla ice cream. It was a HUGE hit. Not a speck was left (which made me kind of sad because I was hoping to take some for my lunch tomorrow! 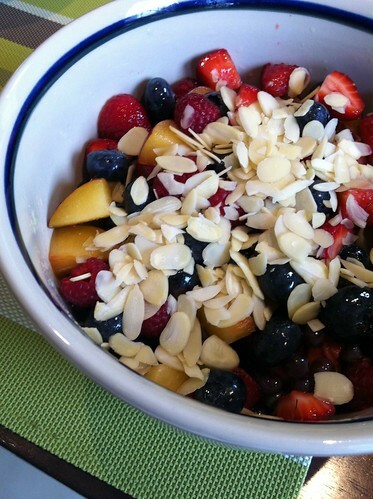 In case you are wondering….I used blueberries, raspberries, strawberries, plums and champagne grapes in my fruit salad. It was a delicious meal with the added perks of a quick clean up and a cool kitchen. I will be very sad when the fresh fruits and veggies are a distant memory but until then…eat up! What is your favorite “go to” recipe when you don’t want to heat up the kitchen using the stove? I love chunky salads in the summer and a good Greek salad and a fruit salad rank right up there at the top! Yum!